Welcome! 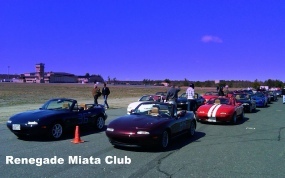 The goal of our club is to enhance the enjoyment of owning a Miata! And we don’t stop there anymore, as we also welcome all Mazda owners -- RX8, RX7, Mazda3, Mazda6, Protege owners can join the club and participate in our autocrosses and events. Autocross Schedule for 2019 is up! 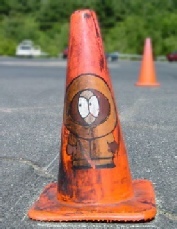 Check our Autocross page for dates and registration info. We will be meeting in the Home Depot parking lot on Route 20 in Marlborough at 10:30am. Please bring a digital camera of some form in order to participate. Please contact Sheryl or Rob to let us know if you're coming. Main Street Automotive Tech Day! April 13th, Main Street Automotive will be holding a tech day for anyone who would like to check their car out before the season begins. Tell them Renegade Miata Club sent you! Renegade Miata Club is pleased to welcome Main Street Automotive as a new sponsor. Main Street Automotive, located at 676 Main Street in Clinton, MA, was started by Bob and Janet Baylis and has been in business since 1988. They specialize in Miata service and performance. Former RMC member and famed Miata mechanic Lester Seal is now part of the team at Main Street Automotive. Tell them Renegade Miata Club sent you! Contribution! Starting in 2018, we’ll also do a fund-raiser during our annual end-of-season banquet: a lottery in which chances can be bought and the pot will be split between the winner and the food pantry. Go to www.loavesfishespantry.org for more information about their charity work. Helmets for autocross should be rated Snell 2005 or newer. The Club has loaner helmets at each autocross if you need one. Vans, SUVs and motorcycles are not allowed on the autocross course. The Autocross Committee reserves the right to deny participation to any car that is felt to be too loud for the event. The Committee’s decision is final and any fees paid will be reimbursed if a car is not allowed to participate. Renegade Miata Club gratefully acknowledges the support of our sponsors. To learn about sponsorship opportunities, please visit our Sponsors page.